For so long, a staple of a solid #selfcare Instagram has been a selfie of one’s face smothered in clay. The earth-derived ingredient has a reputation for being a buzzy face mask base that shrivels up breakouts and reveals a glowier complexion…but that’s not to say it hasn’t come with some flak. After I once again found myself in the depths of a Reddit skin-care thread, I stumbled across someone posing the question whether clay masks are actually bad for your skin. This rang a bell in my beauty-consumed mind, as I’ve heard from certain facialists that any product that pulls your skin back or dries it out isn’t doing your complexion any favors. And so, I set upon an investigative journey. “People with drier skin may find [clay masks] too drying and irritating, whereas people with oilier skin find them helpful to prevent clogging,” one Redditor writes. “I don’t think they are inherently bad, although it’s not advisable to use them too often.” Others agree, noting that sensitive skin types should avoid letting the masks fully dry on their skin—otherwise, your skin can get irritated and, well, too dry. I’ve been guilty of this—that drying action can be so satisfying, as if its sucking up all the gunk in your pores—but McGlinchey says it’s not doing your skin any favors. “The final drying stage of a clay mask draws moisture from the surface of the skin, leaving it blotchy,” she explains. To glean the skin-boosting action instead, remove the clay mask at the “perfect” time: “Just as it’s drying around the edges of the face, nose, eyes, and lips, and is still damp across the cheeks and forehead,’ she says. Now that you know the magic rule, know that the color of your clay mask can help point out which skin type it’s best for. “White clay can be used by pretty much everyone as it’s the most gentle and has a high silica content,” says McGlinchey. 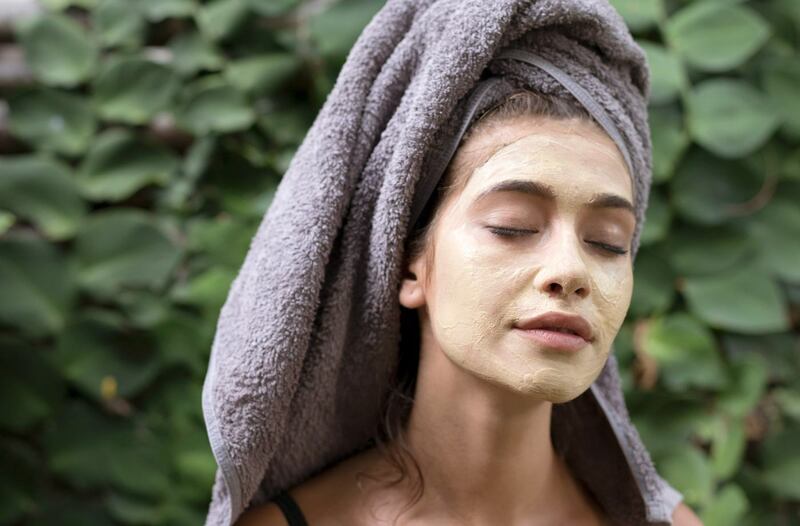 “Green clay is generally used for more oily, combination, and acne-prone skin, pink and red for more normal skin and the lesser known yellow clay is beneficial for sun damaged and dull skin.” So now you can rock that mud like a pro. For other ways of getting healthy skin, try this complexion-boosting foods or slather on these light moisturizers for fall.